Frankfurt am Main: Fischer Taschenbuch Verlag, 1995. 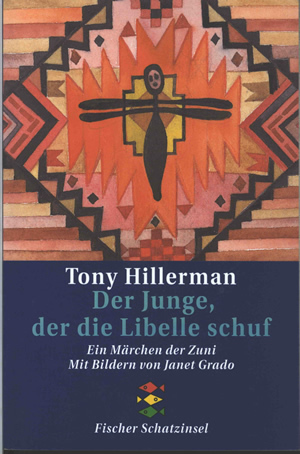 The first German edition of Tony Hillerman's retelling of the Zuni story The Boy Who Made Dragonfly. Translated from the "American" by Bettina Münsch, with drawings by Janet Grado. Published in 1995 by Fischer Taschenbuch Verlag, Frankfurt am Main, Germany. The cover design is by Buchholz/Hinsch/Hensinger with illustration by Doris von Zitzewitz. The illustration is a watercolor painting in Navajo style featuring a stylized dragonfly figure with a human face, surrounded by geometric shapes in shades of red and brown. Inside front and inside back covers feature publisher logo of a palm island in white on a dark blue background. The back cover features the top half of the front cover watercolor illustration, the novel synopsis, the Fischer logo (three fish in red, yellow and green atop one another), the barcode and book price. Binding: Full-color paper covers. Publisher logos, author, title printed on the spine.